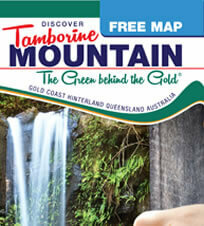 Tamborine Mountain is part of an ancient volcanic rim with an elevation of around 550 meters above sea level. The many natural attractions on offer include fantastic lookout points, allowing visitors to gaze in the distance and enjoy uninterrupted views to the surrounding hinterland and coastline. 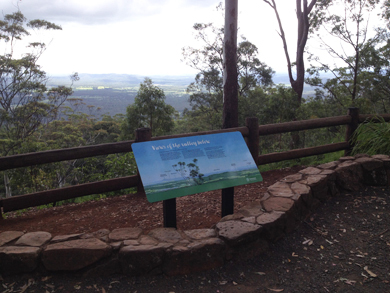 The letters and Numbers behind each Lookout Point refers to the locations of the lookout on the new “TM Visitor Guide and Treasure Map” which can be picked up from any of the over 1,800 good tourism outlets located between Ballina and Rockhampton, with a heavy concentration on the Gold Coast and in Brisbane, as well as all over Tamborine Mountain. The centre of the crater was the now flat area that can be seen from various inland lookout points along the western edge of the mountain providing for endless escarpment views with breathtaking sunsets. Numerous lakes in the valley reflect the evening rays, long shadows mesmerize many visitors who are regularly seen admiring the views. 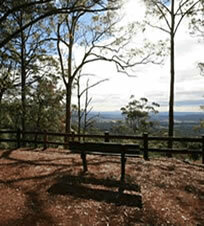 Located at the very end of Knoll Road, this lookout is well-maintained and easily accessible. It offers plenty of facilities and is a popular spot for locals and visitors alike. Reached after a very enjoyable 30 minute hike starting at the “Knoll Road” lookout, this viewing platform allows views inland as well as on to “Cameron Falls”. Past the famous “TM Distillery” right at the very end of “Beacon Road”, this is a less frequented lookout point with a small turning circle and limited parking. Forming part of the “Witches Chase” hiking track, this viewing platform is best reached via a 25 minutes walk from the “Main Western Road” car parking area opposite “Hartley Road”. One of the most popular lookouts located on “Main Western Road” directly opposite the Bavarian Grill Haus Restaurant, equipped with benches and binoculars. 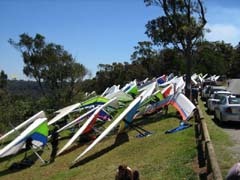 Also on “Main Western Road” this spot often comes alive with numerous hang gliders using this cleared section of the escarpment as a launch site. 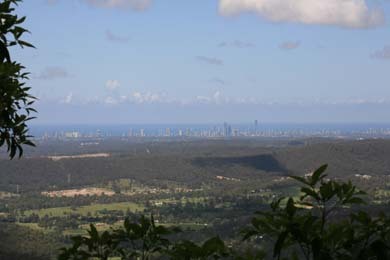 Towards the East visitors are rewarded with fantastic coastal views, often stretching from Moreton Bay to Tweed Heads. At night, the Surfer’s Paradise skyline comes alive, with thousands of lights twinkling in the distance and a light breeze coming from the ocean. The rolling hills on the Eastern side of Tamborine Mountain were formed by run-off lava. Coastal lookouts are fewer, not always easily accessible and often lack parking facilities. All over the mountain, visitors often catch glimpses of the Gold Coast skyline, great care needs to be taken when stopping to admire the views. Visitors are asked to please respect resident’s privacy. This popular Mountain Resort on Tamborine / Oxenford Road boasts fantastic uninterrupted views, offers plenty of parking and is open to anyone. Views are partly obstructed by trees. There is a large turning circle at the end, also offering limited parking. Again care needs to be taken when stopping to admire the views, a short walk from where cars can be parked will be necessary. 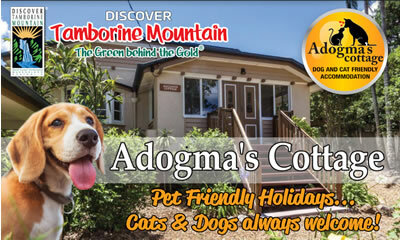 Being located on one of the busiest roads to Tamborine Mountain, this vantage point tends to cause traffic problems. Please park well off the road, and consider resident’s privacy. 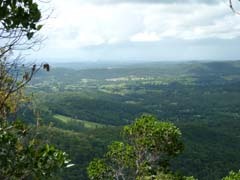 This entry was posted in Tamborine National Park and tagged Gold Coast, hinterland, lookout, LOOKOUTS, mount, mountain, Tamborine, views on January 1, 2013 by admin.